Tiffany, the talented author of Just a Little Bit Downsy, is very graciously helping me to promote my book. I have sold over a hundred copies so far and am so glad the word is getting out. In my mind, I created a book of lessons learned, as well as a message of hope. However, when Tiffany reviewed it for her blog, she hit the nail on the head. "From Grief to Celebration, How One Family Learned to Embrace the Gift of Down Syndrome" is much more than a love story. 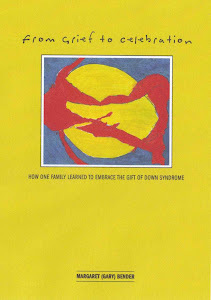 What I really created is a practical guide of Down syndrome, almost a "how to" book. Following is my paraphrased version of Tiffany's review. Thanks Tiffany! It occurred to me that you may be looking at this book, thinking, "I am fine with my kid now, thanks so much. I don't need to wallow in the struggle anymore." Which, believe me, I totally get. But let me say this really quick. You don't deal with the next 50 years right off the bat. You deal with "Now" every few years or so. When changes (or the lack thereof) come, you will regroup. I promise, in big ways and little ways, on purpose or because your life forces you to. This is not a weepy, what do I do now, I'm so depressed book. It gives practical support on how to be the best parent for your child as you can be, and this advice stretches across the years. The book is based this on the list of ten verbs Gary found to most encompass our lives as parents with kids who have Down syndrome. Um, self-explanatory. But this explains why it is an important component of growth and the ability to celebrate! This is a fantastic list of resources that will aid you in learning how to be the best parent that you can be. How you can be therapist, advocate, medical professional, teacher, and proactive parent; in the manner that empowers you and helps YOU to make choices for your child, and not get pushed around by "The System". (I loved this chapter.) 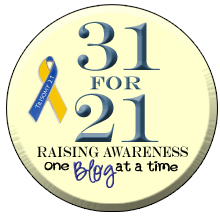 It shares how to make Down Syndrome a part of your life, and not let take it over. She even brings in how it impacted her other children and their view of it. Once it is a beautiful part of your life, she offers suggestions on how to share its beauty with others. Advice on how to include "normal" in the "special" world and vice versa. Support and advice on how to understand and support your child with Down syndrome. Also included, is how to understand "outsiders" and how to educate them and help them help you. Practical advice on how and when to fight for your child's rights and to teach them how to fight for themselves. Shouldn't you live your life this way? How to look for it and expect it. Again, great advice. YOU are the parent, do not live your lives letting others tell you what to expect. Practically, plan for the day-to-day and plan for the future so you do not drift aimlessly. Please if you know anyone who might benefit, or feel comforted please share our story! It is available for $13.99 on the sidebar of this blog.